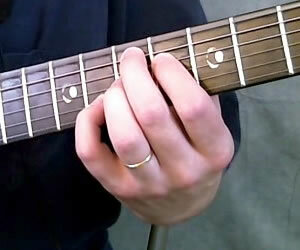 In this video guitar lesson I’m going to show you an E7(#9) chord. That’s “E Seven Sharp 9”. Or it’s also known as the Jimi Hendrix chord. He played it in the song “Purple Haze”. So here is the chord chart for E7(#9). 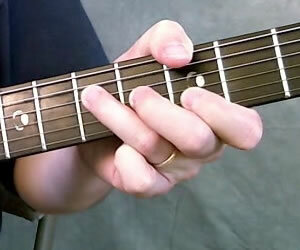 If you just played the middle 4 strings, this becomes a moveable chord form. 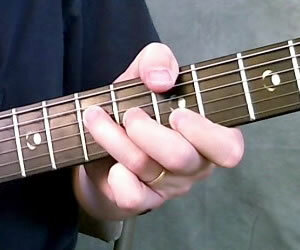 So for instance you could move this down 2 frets so that your 2nd finger was on the 5th fret of the 5th string (D). That would make this a D7(#9). But with E7(#9) you can also play the open 6th string, which is E.
Now this chord is not just used by Jimi Hendrix in “Purple Haze”. In fact it’s more often used in Jazz than in Rock music. But to put your new chord to use and have a little fun, let’s take a look at the chords from Purple Haze. In addition to the E7(#9), Hendrix also played a G and A chord. But not the basic G and A chords that you might know, or even barre chords. Jimi Hendrix often played moveable major chords by playing a note on the 6th string with his thumb. He had fairly large hands, so this was not a problem for him…and if you have small hands this might be a little difficult…but give it a try. So for a G, play the 3rd fret on the 6th string with your thumb. You also want to mute the 5th string by lightly touching it with your thumb as well. You will want to mute the 1st string by lightly touching it with your 1st finger. For the A chord, just move the G chord form up 2 frets so that the note you are playing with your thumb on the 6th string is an A note. 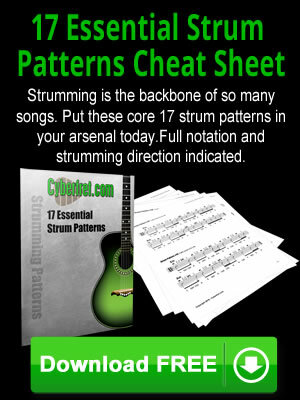 So here are the chords and a basic strumming pattern you could play. If you want to learn more about strumming songs like this, be sure and check out my Rhythm Guitar Mastery course. Have fun with your new Jimi Hendrix chords.